The DCHB200 series of DC/DC power converters provides up to 255 Watts of output power in an industry standard half-brick package and footprint. This series consists of single output models ranging from 3.3VDC to 53VDC with 2:1 wide input voltage ranges. Some features include high efficiency up to 93%, adjustable output voltage, and remote on/off control. These converters also have short circuit, over voltage, over current, and over temperature protection. 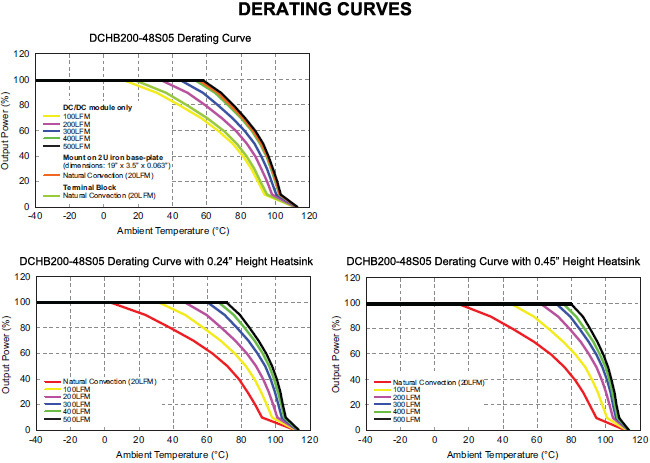 The DCHB200 series is RoHS compliant and has UL60950-1, EN60950-1, and IEC60950-1 safety approvals. 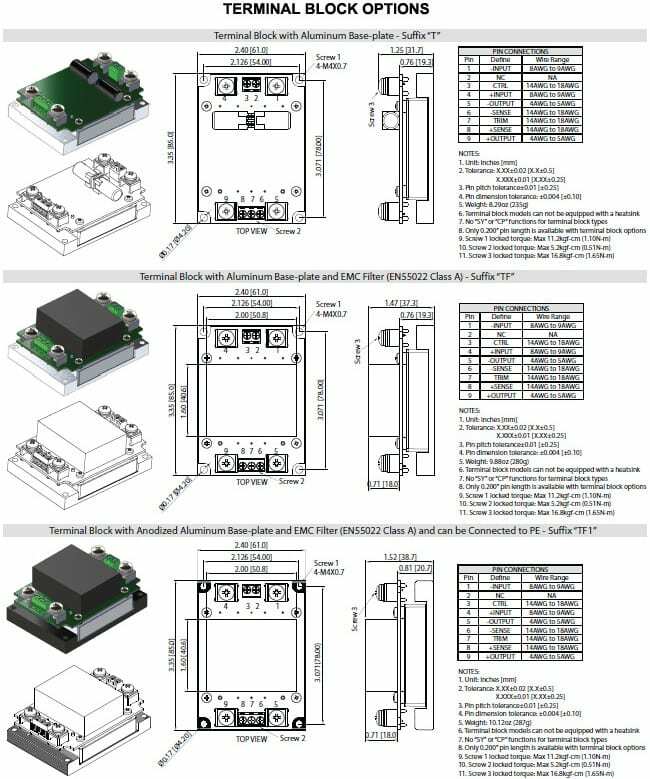 Several different options are available for this series including negative remote on/off control, terminal block, pin length, heatsinks, sync pin, case pin, and thru-hole inserts. ensure the ground potential differences between the modules are minimized. (4) More relevant information in the application notes. corresponding +OUTPUT and likewise the -SENSE should be connected to its corresponding –OUTPUT. (3) Heat sink is optional. See the “Model Number Setup” table on page 7 for suffix options. 5. The DCHB200 standard models (without assembly options) can only meet EN55022 Class A or Class B with external components added. capacitors (Nippon chemi-con KY series, 220μF/100V) in parallel. for trim up or between TRIM and -SENSE pins for trim down. To calculate the value of the resistor RU and RD for a particular output voltage see page 7.
inserts. 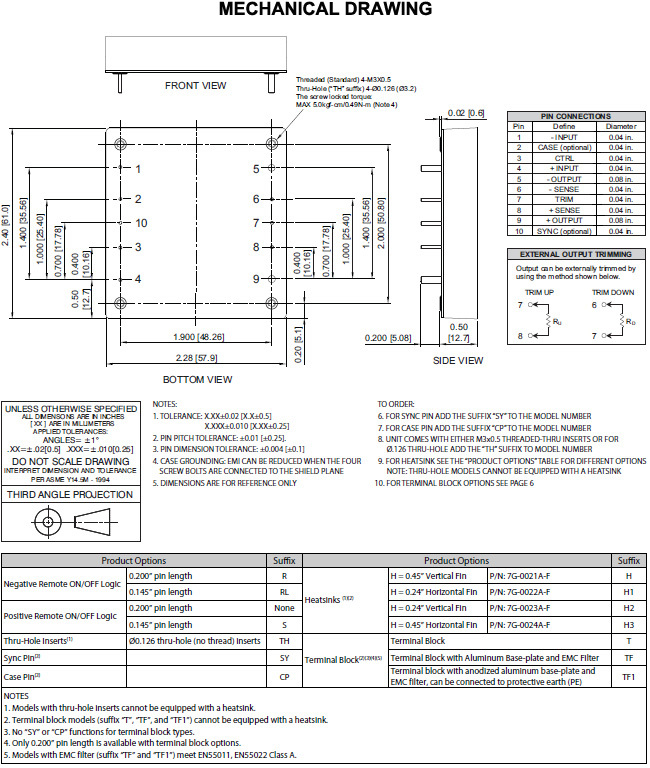 See the “Model Number Setup” table on page 7 for more ordering information.